L.A. PIE STORY: SMORGASBURG... I'M A BELIEVER! 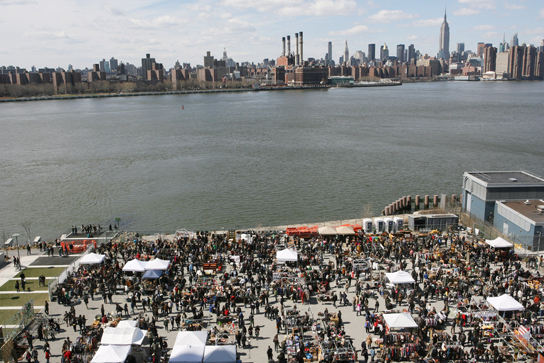 I spent the day with my friend Cathryn and her son Diego at SMORGASBURG, an all-food market hosted by Brooklyn Flea at East River State Park, for what amounted to a food rave with New York City's best artisan food purveyors. It was a literal smorgasbord of good eating. This not-to-be-missed event happens every Saturday, 11am-6pm, rain or shine, so go get your eat on! No Smorgasburg is complete without pie and lucky for me, there were two pie vendors present - cutie pies, 'hand crafted baked goods' by chef Alice Cronin and Butter & Scotch, a bakery featuring liquor-infused creations by Allison Kave (First Prize Pies) and Keavy Landreth (Kumquat Cupcakery). As a nod to the Kentucky Derby and the "the greatest two minutes in sports", I opted to try Butter & Scotch's Mint Julep Cream Pie, and because one slice is never enough, their S'more Pie. Both were absolutely scrumptious although beware of the Mint Julep Cream Pie if operating heavy machinery immediately after consumption -- potent! Deigo, who recently celebrated his first birthday, took his first bite of pie and Hooray! He's a believer!